I became interested in Blacksmithing…..
because of my work for the Colonial National Historical Park at Yorktown, VA. I started in 1999 building 18th Century (American Revolution era) reproduction Cannon Carriages. The entire experience of taking hot metal out of the forge and hammering it into shape at the anvil quickly became more than just something I had to do for work, but a passion, there is just something about doing the very same thing that a Smith did 100, 300 or even 1000 years ago and making a piece of Art or utilitarian Art using those same skills. There are modern power hammers and other tools that allow for more rapid production, but there is nothing that compares with creating something entirely at the anvil with your hammer. Blacksmith, Wheelwright and Timber Framer are the crafts necessary to make cannon carriages. It took a few years to decipher the nuances of old English and French mannerisms and apply them to the construction of a cannon carriage, but I was successful and am able to do so for Colonial National Historical Park. I only build cannon carriages for CNHP as it requires an industrial size shop for both woodworking and blacksmithing. I was most fortunate to have had Colonial Williamsburg blacksmiths; Peter Ross, Ken Schwarz and Sheldon Browder and Master Wheelwright Ron Vineyard, close by to ask questions when problems rose. Their willingness to share information was most welcomed and has served as my guide to being a good steward of the Blacksmith Craft. When I was starting out, I didn’t even know what questions to ask in order for the Smiths to provide me with the answers I needed to perform my work. Luckily, they provided answers to my unasked questions and ones that I didn’t even realize I needed to ask. During that early period I took courses of instruction by Don Witzler, Charlie Orlando, Julie Clark and Greg Price at the John C. Campbell Folk School, Brasstown, NC. I’m glad to have been fortunate enough to have observed and continue to observe truly gifted smiths perform; Clay Spencer, Joe Miller, Dan and Tom Boone, Fred Crist, Jymm Hoffman and Joe Scott, to name a few. It is a culmination of those who have provided me formal training and others that have shown me a technique here and there, and yet others through demonstrations at events that have provided an idea or an answer, sometimes without even knowing it. In addition to those already mentioned, there are many that will go unnamed for the usual host of reasons. My quest for knowledge continues and so does the list of Smiths who are influencing me. The first blacksmith organization I belonged to was Tidewater Blacksmith’s Guild. I joined them in 1999 and served as Secretary from 2005 to 2007 and Newsletter Editor from 2007 until 2010. I joined Blacksmith Guild of Virginia (BGV) in 2006. They did an awesome job with their demonstrations and events. I have been a member of the Artist Blacksmith Association of North America (ABANA) since 2004…well worth the money, in case you have any doubts. I participate in Artist Blacksmith Group of Tidewater’s demonstrations at many regional events and enjoy the company of fellow blacksmiths and enthusiasts. These events are an awful lot of fun as we get to work with other smiths and interested individuals with whom we would not otherwise get the chance to meet. I co-founded the Artist Blacksmith Group of Tidewater (ABGT) in October 2009 with Joe Gentile and held our first official meeting March 10th 2010. In June we were accepted as an Affiliate of ABANA (Artist Blacksmith Association of North America). Our group is by design meant to be an eclectic group working together to make projects for the benefit of the Blacksmithing community and the expansion or our own skills. 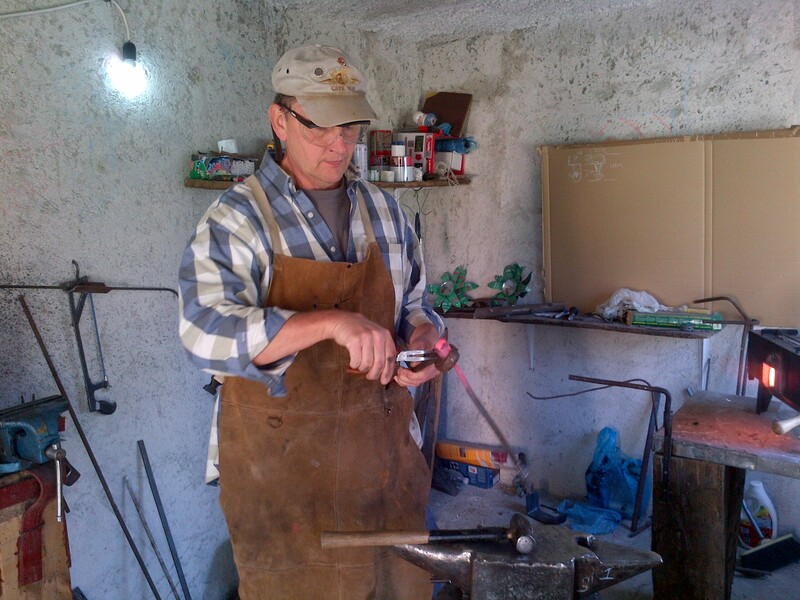 This is our effort to keep traditional blacksmithing skills relevant to todays world as Art and Functional Art. We also provide a historical context of the importance of the Blacksmith in history. It is a great group and getting better all the time. I continue to support ABGT as the FaceBook Page administrator. Blacksmithing allows me immediate gratification with each blow of the hammer. There is something special about being able to make steel do what you want it to. The fact that you can add, subtract and change it from rough to elegant, sharp to soft edged, give a heavy object a lightness that would otherwise not be possible, reminds me that a simple thing can be complex and a complex thing simple. The satisfaction of figuring out how to make a complex pattern work is a great feeling at the end of the day. The ability to take a piece of discarded metal and transform it into something beautiful is what makes Blacksmithing a wonderful medium for my artistic expression whether it be great or small. Happy Haven Forge it’s very name for me invokes memories of years gone by. When I was growing up my Father purchased a piece of property near where he grew up and it was named… Happy Haven. We, my Dad, brothers and on occassion my Mom would go there for the weekend. Mostly it was used for a place for us to go hunting. We had many great times there and since Blacksmithing makes me Happy, the shop area is sort of a Haven and contains a Forge, that is where the name comes from. Happy Haven Forge. Hi Vince, Thanks for following my blog. I am new to metalwork and smithing, having only started in Feb this year – but it has me in its magic hold! My challenge is to find places where I can continue to learn, so I am thankful that Owen Bush runs his courses. I am very flattered that an experienced craftsman like yourself takes an interest in my blog. Thankyou. I always recommend joining the closest blacksmith group to you. It will provide contacts and others who can offer advise and keep you abreast of the local BS events where you will surely find tools and equipment that you will need. Most groups offer some kind of training opportunity at each meeting as well, but just being able to discuss projects and problems with others is of tremendous help. When you are ready take a look at the national org. ABANA and see if you can help support them in some way as well, if not become a member.